NO KIDS ALLOWED!!!! Seriously! Leave this page immediately if you are under 18!!!! The picture to the left will also serve as a warning that people who are queasy about blood, needles, singed flesh, etc, should hastily turn around and go back to whence they came. 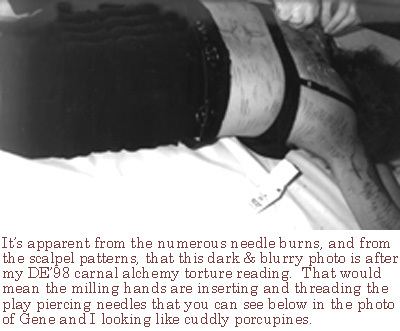 The photo was taken at Death Equinox '98, after my torture reading -- the numerous little marks are burns from hot needles, the longer and bloodier marks are cuts from razor blades. And, yes, plenty of people have informed me that I am completely insane. You can join the club if you must, but it would be pretty redundant. This page is currently a mess, especially since Gene's collection of DE torture reading and play piercing pictures went away and I can't seem to find any of my own Death Equinox picture collections (if anyone can help me out, please do!). I will add more "soon", for now I'm mostly doing a little emergency clean-up and working with whatever cruddy quality things I can. At the least you can still find a link to Rev. Ivan Stang's (Church of Subgenius) coverage of DE '98 (where you will find some wholesome pictures, and some completely unwholesome pictures... most of the ones I'm in fall into the latter category). As for explanations: if you can't understand what on earth compelled me to do the things portrayed in some of these photos, try reading some of my writing. Revealing selections (written during the Death Equinox time period) might include Without Pain, Without Death (fiction) and Self-Mutilation: Destructive or Therapeutic? (article). SubGenius DE '98 Site: Rev. Ivan Stang put up some photos he took of me and others at DE '98. There are two of my bloody arm and back, there's one of me modelling the latest "clothes-pins around the waist" fashion AND one of Bruce exhibiting his clothes-pinned arm whilst I hover in the background (with a camera in my face, wearing a black bra), and there's a rather hideous and exhausted looking photo of me (fully dressed!) that probably still didn't look nearly as hideous and exhausted as I was on that final day of the convergence. Te wo Tsunaide Archives: Normal alert! A sign of getting old, me hosting nice little family-friendly Pair Go tournaments. If you browse through the archives here you can find several completely non-bloody and non-perverse pictures of me. My Organizational View Reports, the Awards pages, and the generic photo galleries are the usual places to find pictures of me.